A big shift in Lord Byron’s style is usually noted: the potently gloomy Eastern Tales, showcasing the magnetically alienated Byronic Hero, give way to a sharply contrasting style, that of the conversational Don Juan. Accounts of Byron’s career tend to treat this alteration as sudden or whimsical.  In fact, it is intrinsically tied to exile, a connection illustrated by the verse romance Mazeppa (in many ways the forerunner of the contemporaneously begun Don Juan). Mazeppa is Byron’s most elaborate--even systematic--depiction of exile; its hero, tied onto a wild horse and sent off into the wilderness, learns to endure amid dramatically changed circumstances. As its hero describes his travails, Mazeppa yokes together a number of entities forced to interact, uneasy pairings that include horse/water, man/horse, past/present, history/romance, and narrator/auditor. Dialogic interchange thus shapes Byron’s portrayal of exile; the conversational style he developed in Italy underscores M.M. Bakhtin’s emphasis on interaction across boundaries. Byron’s investment in alteration helps us to frame his seemingly dismissive treatment of some contemporaries, particularly Laker poets. As Mazeppa particularly demonstrates in its elaborate echoing of S.T. Coleridge’s Rime of the Ancient Mariner, Byron’s denouncement of what he called the “wrong revolutionary system” was not repudiation so much as interchange, from the vantage of exile. 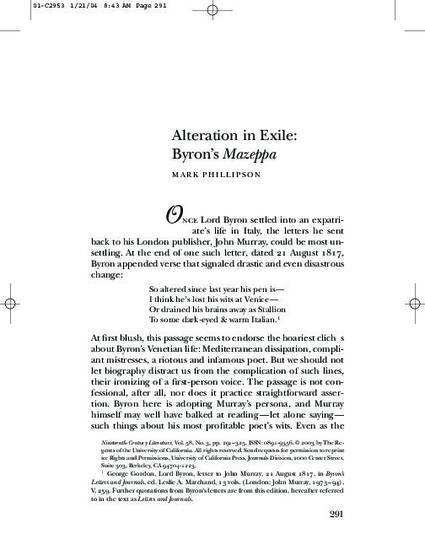 Unlike the Rime, Mazeppa envisions narrative as subject to unpredictable recontextualization, a submission that marks exiled poet and distanced reader as the most important dialogic paring in Byron’s late work.